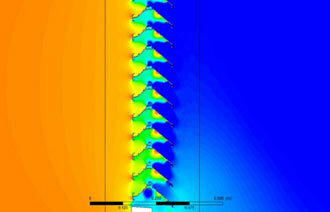 Solution: The louver profile developed through CAD model was utilized to perform CFD simulations. The simulation domain was identified and flow analysis from both the directions was performed. The pressure drop values were estimated across the louver grill. The primary purpose of louvers is to permit the entry of light and air inside the room, while keeping out rain, direct sunshine and noise. Designing louvers require the identification of air flow rates along with the louver profile and placement angle. CFD simulations become extremely useful in such cases to visualize the flow properties and identify constraints to optimize the lover profile. A Hong Kong based louver manufacturer needed to simulate the flow across the specially designed louvers and estimate pressure drop, in order to evaluate the overall design. 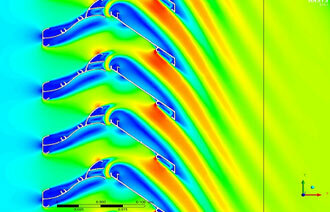 The louver profile was developed through CAD tools and suitable physical constraints such as inlet air flow velocity and no slip wall conditions were applied to capture the flow physics. The pressure drop across the louvers was measured, considering flows from both the directions alternatively.